We asked for information regarding its history and we had this interesting response from Winston Price who as a boy lived in Pontlliw and with his father would visit relatives in Three Crosses travelling on the United Welsh bus. On the return journey the bus frequently stopped outside Sketty Police Station waiting for the lights to change at Sketty Cross. Winston’s father was a stonemason – and pointed out to young Winston that the letters of the name SKETTY POLICE STATION were made of wood. Winston later joined the Glamorgan Police Force and transferred to Swansea in 1965 and when he was stationed at Sketty a few years later on promotion, he made a point of checking it out. He found that the first 4 letters SKET were constructed from wood and the remaining letters TY were moulded in cement. 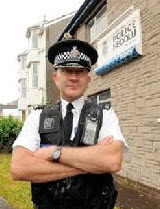 He later read in the Swansea Police History Book “To Guard My People” that the Station was indeed once a County Police Station and obviously the letters SKET covered the previous letters COUN, probably to save expense. He remembers seeing two tall Swansea Borough Policemen whilst travelling by bus and he was intrigued by the small brown cases they carried, imagining that they contained policing aids such as “ magnifying glasses” He was very disappointed to find that the cases merely contained their sandwiches , cutlery etc for their meals! Winston also recalls the former Fforestfach Police Station (later to become White Tyre Remoulds) - again a former County Police Station. He noticed that this building was exactly the same design etc as Barry Sub Divisional Police Station where he was posted during his time in the Glamorgan Force. 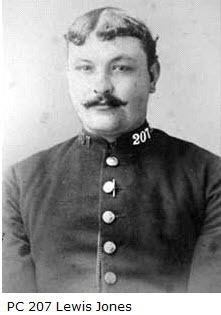 As a result of receiving an email request (see below) from Paul Gibson, this page has been specially created with a view to collating as much information as possible about the history of Sketty Police Station and a certain police officer by the name of Charles Bray SMITH who was based there in the Victorian period, between 1882 - 1884. The existing Sketty Police Station is located on 132 Gower Road, Sketty, Swansea, SA2 9BT, about 200 yards from Sketty Cross. The present Station was built in the 1970's or 80's on the site of a very old Police Station. Does anyone have photographs of the Old Building or any information/stories about it please? Contributions would be very welcome. Sketty Police Station was one of a number of properties that South Wales Police wanted to close down and sell but in 2010, it was taken off the Market and is now kept as a base, being central to the community and of course, the Gateway to the Gower. The present Sketty Ward contact is PCSO Fred Lerwell. I came across your site by accident...I'm trying to find out a little bit of information in regard my great grandfather of whom I attach a picture and I was hoping someone in your group may know the answer. He was an officer in Sketty between 1882 and 1884 and wondered do any of you know if there was a station there or perhaps just a box (Tardis) and where it may have been located? To be honest I'm not expecting any of you to have actually worked with him and remember him personally! :-) but any information would be helpful as I'm attaching photos to his career in my project. Paul Gibson was born in Swansea, and lived in Fullers Row behind the art gallery. "I actually remember seeing the black Marias and Im sure the Fire engines in the late fifties, early sixties coming out from the side of the old police station.... I have my great grandfathers career details around South Wales to his rise as Sergeant (and have just come across his truncheon from his service days with some other branch of the family which i didn't know about in Leamington Spa)...I found it fascinating and how different it was for them in those days in their equipment as you may be able to see his torch on his belt..quite primitive compared to today! It's been helpful that you have told me the new police station is built on the site of the old one...so i don't have to search for that anymore...although i will search for some old photo's on the net"
Here is an actual facinating pocket book account written by Pc 207 Lewis Jones, of Llandybie, Carmarthenshire, details of which can be read on the South Wales Police Museum Website. 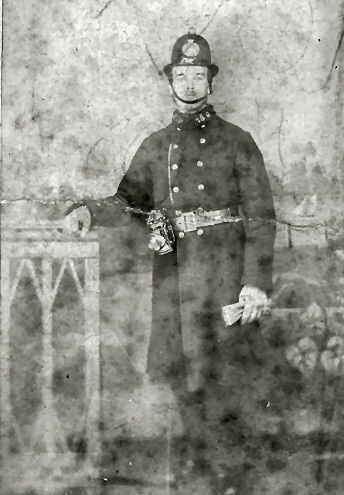 He joined the then Glamorganshire Constabulary in 1859. Mention is made of visiting Sketty Station to collect his Pay! The average hours of duty were never less than nine hours. The book provides a useful insight into life as a Police Officer in rural Wales in the Victorian period.